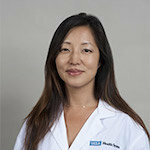 Dr. Kim is an Associate Professor in the Division of Pelvic Medicine and Reconstructive Surgery in the Department of Urology at UCLA Health, Los Angeles, CA. She received her undergraduate and medical degrees from the renowned BA/MD program at Rice University and Baylor College of Medicine, both in Houston, TX. She completed a Residency in Urology at the Cleveland Clinic Foundation, Cleveland, OH, and received a Fellowship in Female Pelvic Medicine and Reconstructive Surgery at UCLA. Dr. Kim’s clinical interests include neurogenic and non-neurogenic voiding dysfunction, interstitial cystitis, benign prostatic hypertrophy, incontinence, neuromodulation for overactive bladder and urinary retention, vaginal prolapse, genitourinary reconstruction, and recurrent urinary tract infections. Dr. Kim has expertise in pelvic floor reconstruction and robotic and laparoscopic surgery. She aims to use these skills to improve patients’ quality of life and to help them regain physical function. Dr. Kim is involved with numerous professional organizations, including the American Urological Association, the Society of Women in Urology, the Society of Urodynamics and Female Urology, and the American Urogynecologic Society. She is also a reviewer for Neurology & Urodynamics, British Journal of Urology, Journal of Urology, and Urology. Ja-Hong Kim, MD, discusses the increased demand for pelvic floor reconstructive surgery, historical surgical methods, and complications associated with these methods. She then reviews two novel applications of fascia lata graft with video demonstrations of surgical techniques. Ja-Hong Kim, MD, discusses the burden of recurrent urinary tract infections (UTIs) and treating patients with antibiotic stewardship during this era of emerging multi-drug resistant pathogens. She then emphasizes UTI prevention through patient education, promoting bladder and vaginal health, and minimizing risk factors.